Camp Humphreys Flood Hazard Evaluation (Korea) | WEST Consultants, Inc.
Camp Humphreys is located three miles southwest of Pyongtaek City and adjacent to the Anseong River in the Republic of Korea. U.S. Forces Korea is planning for the expansion of Camp Humphreys in anticipation of possible Army base relocations and consolidations. However, the camp and the proposed base expansion are subject to two flooding sources: the Anseong River and interior drainage ponding. The Anseong River banks are lined with earthen levees that provide some flood protection to Camp Humphreys, however the level of flood protection is uncertain. 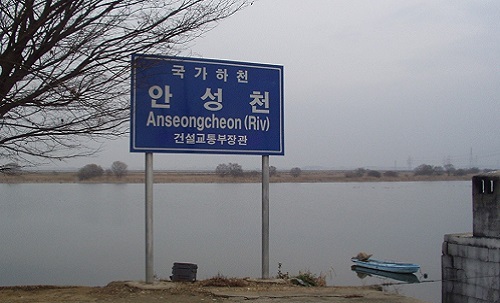 The Anseong River is also tidally influenced. In addition to riverine flooding, interior ponding has occurred in Camp Humphreys during high flood stages of the Anseong River. Localized runoff ponds within Camp Humphreys when normal outflow through existing drainage culverts is backed up from coincidental high flood stages on the Anseong River. The purpose of this study is to determine the potential flood hazards of Camp Humphreys and additional base expansion and recommend flood mitigation measures. The project consists of hydrologic and hydraulic (H&H) flood analyses, floodplain mapping, conceptual flood mitigation designs and cost estimates for Camp Humphreys and the proposed base expansion. WEST Consultants is providing the H&H analyses and floodplain mapping for existing and proposed conditions to MMI International, as well as helping to develop flood mitigation strategies. Hydrologic, hydraulic, and interior flood modeling is being performed as part of these services.